It's nearly Memorial Day and time again to kick off the 2009 summer driving season. Each year just prior to the holiday weekend, the major talking point in the media is undoubtedly "What will the cost per gallon of gasoline be over the summer?" This driving season, holiday travelers will have something to rejoice about; lower fuel prices. Average gas and diesel prices are significantly off of their all time highs reached last year on July 17th, 2008 at $4.114 and $4.845/gallon respectively. The fall in prices has been so pronounced in fact, that AAA has forecast that travel will be up 1.5% over the holiday weekend. A counterintuitive estimate, when one considers the US's staggering 8.9% unemployment rate. With average prices today around $2.26 for gas and $2.28 for diesel, off roughly 50% from last year, what should the average consumer expect for the summer? The next several months? Or even... the next several years? In an attempt to predict where fuel prices will be in the future, it would be wise to understand how we got to where we are today. The large run down in retail fuel prices, from all time highs in 2008, has been driven primarily by concerns that the global recession would be long and deep. Those same concerns have helped to increase the global strength of the US Dollar (the currency by which energy is primarily priced - bearish for oil) and spurred global crude oil demand concerns within the market. By mid July of 2008, Crude Oil traders the world over saw their fears of a long global recession begin to materialize. The dollar began to rally, and demand estimate after demand estimate indicated a dire future for oil was nearly unavoidable. As a result, crude began its decent from an all time high of $147.27 a barrel in July of 08', to a five year low of $32 a barrel in February of 2009. 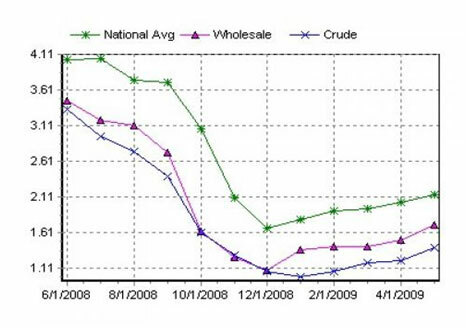 As you can see from the chart below crude's fall was highly correlated to the price of retail fuel; leading per gallon costs lower until around December of 2008. By December, although global supply remained much higher than demand, prices at the pump began to rise. This occurred largely as the factors attributed to the weakening of crude oil prices from above appeared to be unwinding. More specifically, at this time OPEC began to actively coordinate attempts to cut output and affect global supply. In addition, around that time the US Dollar rally also began to show signs that it was fizzling out. However, and perhaps most importantly, these fundamentals were changing while institutions with free storage capacity began to speculatively purchase crude. These speculators began to buy into the markets as the tide began to change on hopes that oil would be more valuable by mid to late 2009. It was this institutional involvement, in conjunction with ever so slightly improved fundamental data that was able to bring us to where we are today; crude at roughly $60/bbl and prices at the pump of around $2.25 nationwide. So now that we know how we got here, where are we going? According to the Energy Information Administration (EIA: http://www.eia.doe.gov/steo) summer fuel prices are anticipated to remain down from last year's high. They are projecting that the summer average price per gallon of regular gas should be around $2.21 per gallon; down roughly 42% from last summer. They are also anticipating the price of diesel to remain down from last summer at a cost of $2.26 a gallon. I think for the summer they will be wrong on this estimate, though only slightly. In the short term, the crude oil rally which is currently taking place may continue up slightly higher. Over the next several weeks I expect crude prices to rise between $5 and $10 dollars to settle within the mid to upper sixty dollar/bbl level. This price increase will continue to be driven by the irrational exuberance currently plaguing both the equities and commodities markets. The hope that the economy has bottomed, although fundamentally unfounded, will likely give momentum traders more room to run with this rally. This will occur solely because the markets are willing to stay irrational for longer than most can stay solvent. As a result, although I do not buy into the view that "green shoots" are sprouting within the economy, it would be unwise to fight market sentiment in the near term. As crude oil continues to rise, the US Dollar continues to soften, and summer demand for fuel increases, retail fuel and wholesale oil prices are likely to climb and remain correlated to the broader markets. Although I do not anticipate prices to come back in line with levels seen last year, I do expect them to be higher than the EIA's forecast. I am anticipating that the average cost per gallon of unleaded gas will be between $2.45 and $2.60 for the majority of the summer; or 10 to 15% higher than estimates. I also expect diesel prices to follow suit and move up from the current average of $2.28 to around $2.50 per gallon throughout most of the summer. I am however expecting oil to come off of my forecasted near term highs, and return to trading within the $40 to $55 dollar range by early fall. Once we get back to the $40 to $55 range what happens from there? Currently we are seeing a largely correlated, bear market rally across all financial sectors. Now, more than ever before, crude oil prices are being tied to the successes and/or failures of the equities market. 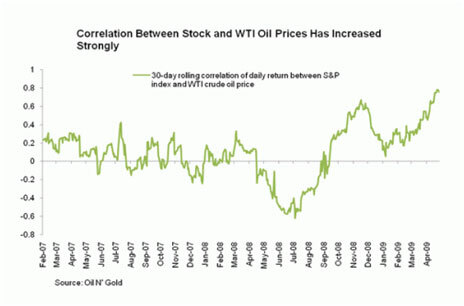 This is in stark contrast to the negative market correlation seen at oil's all time high in July of 2008; which is worth considering in and of itself. Since the global economic crisis has shown few lasting signs of letting up, it is highly unlikely that oil speculators will be able to continue to support oil's current pricing. Although the broad markets and media tend to believe the worst of the economic crisis is behind us, I do not concur. It is my feeling that the worst of the crisis will be upon us within the next three to six months and should drive fuel prices lower than they were in December of 2008. On May 12th, China released figures announcing that their exports were off 22.6% from the same period last year. On the same day, the USIA also slashed its forecast for 2009 global oil demand by 420,000 barrels per day to its lowest level since 2004. One day later, on the 13th, the US also released its April retail sales figures which indicated consumer spending had fallen .4% from the figures provided in March. This drop was in stark contrast to earlier estimates indicating that retail spending would be up .1% on the month. Lastly, on May 8th, the US indicated that another half million jobs were lost and unemployment had edged up to 8.9%. The announcement marked the 16th month in a row that net jobs were lost in the world's largest single nation economy. When considering statistics like this, it doesn't take long to realize that global demand for petroleum will continue to fall as international consumers, lead by those in the US, are forced to retrench even further. In addition to falling global demand for oil, for the next year or so I expect the world to continue experiencing global deflationary pressure. Currently, the idea that the US is in a deflationary period is largely unrecognized. At this time the vast majority of market commentators and economists are calling for rapid US Dollar inflation. This would be a very bullish indicator for oil prices, however I think their timing on inflation is off. Deflation, when properly defined, is a net decrease in the money supply and credit, which is currently occurring. (I wrote on the net decrease in credit and money supply recently in a piece hosted at CNC titled "Hyperinflation is Not Coming Soon...Here's Why.") Furthermore, it is worth noting that deflationary periods are most commonly seen after large credit bubbles burst. As the largest credit bubble in history recently exploded, the fact that global deflationary pressure is upon us should really be no surprise. 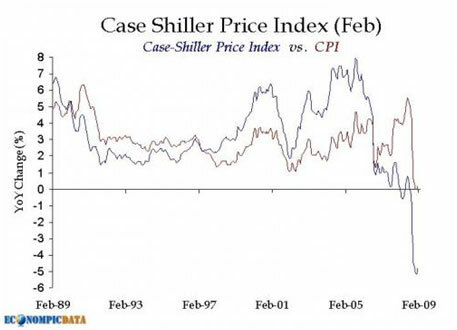 Clear evidence for deflation can be seen within the most recent Case Shiller Consumer Price Index (CS-CPI) measurements. The CS-CPI is widely believed to be more accurate than the CPI figures presented by the US government. This is largely due to CS-CPI's inclusion of actual housing price data rather than Owners Equivalent Rent. The index through April has been negative for 6 straight months and shows no signs of going positive any time soon. Based on the CS-CPI, it is increasingly apparent that prices are not inflating, but are rather deflating; a very bearish sign for all commodities. As deflationary pressures drive all prices lower, reduce global demand, and move traders out of commodities and towards safety, I am expecting to see the price of oil fall. I think they will fall so hard in fact, that it would not be inconceivable to see oil return to the 2004 prices of around $25/bbl within the next year to year and a half. In turn, I also expect to see the prices of both pump diesel and gasoline drop towards 2004 levels between $1.50 and $2.00 per gallon. With oil prices below $50 dollars a barrel, increasing global pressure to reduce carbon emissions, and more stringent exploratory policies taking shape in the US, it has not been advantageous for oil companies to expand. As a result of this untenable landscape, monies that would normally be flowing into deep sea and Arctic exploration endeavors have become economically unjustifiable. This will become problematic to global supply as most major oil fields tend to reach their maximum capacity after forty years of operation. Since the world's largest oil fields (Mexico, the North Sea, China, and most in the Middle East) were opened nearly 40 years ago, and no new, highly accessible, major oil fields have been developed for roughly 40 years, it is logical that supply will grow tighter. In addition to this, as oil companies withdraw exploratory funds, companies which build and operate exploratory machinery are likely to face deep financial challenges. The almost immanent loss of oil capacity over the next several years will eventually create a very bullish sentiment towards oil driven by supply concerns. As a result, when the global economy emerges from the current recession, there is likely to be larger than normal pressure on fuel prices. Certainly to this forecast, many will argue that technology should find a way to avoid this problem. However, the world has yet to find a viable cheap energy source that compares to oil. Nothing produces as much energy, in as cost effective way as oil. As a result, it is highly unlikely that a logical, global replacement will emerge to power all petroleum dependent applications within two to three years. This will be especially true, as there is no current incentive to pursue investment in new technologies and/or exploration. Since there currently is no viable alternative to oil from a cost perspective, and nearly all industries require some form of petroleum, prices will have to rise. At this time I would expect oil prices to climb to $100/bbl or more. As we've seen in the past, when oil trades at $100 a barrel or higher, only then will it become advantageous to seek out oil alternatives. As a result, since it is unlikely we will replace our oil dependency in the near term; within the next 2 to 3 years I anticipate gasoline and diesel prices to routinely cost around $3.50 or more per gallon. James Bibbings is an associate editor at Commodity News Center ("CNC"), a website which focuses on providing the latest commodity news and analysis. In addition to this Bibbings is also the president of Hugo James Consulting; a firm which specializes in offering compliance solutions to the brokerage industry. Mr. Bibbings writes daily as the "Economic Bibb" for Commodity News Center and through his writings strives to provide a unique outlook on the economy, the financial markets, and the global political landscape. It is his intention to add variety and insightful information to what he feels is an "over informed, yet "under educated" populace.